The experiments reported in this article were carried out in the Toronto Laboratory in 1892-93. Three questions were set for research, all of them bearing on the question of the degree of relativity of reaction times: either the difference of a single individual's times, according as there [p. 260] were subjective (attention) or objective (qualitative stimulus) changes in the conditions of his reaction; or the differences of reaction times for different individuals under identical conditions. To secure results comparable in the respects in which comparisons were desired, certain precautions were made, as follows: (1) each reagent reacted at the same hour from day to day, and at the same hour with each other reagent whose reaction was to be compared with his; (2) the order of change in the conditions of reaction (as sensory-motor, light-dark, visual-kinæsthetic, etc.) was kept in the main the same for the different reagents. The Hipp and D'Arsonval chronoscopes were used, both controlled by the records of a König tuning-fork recording on the drum of the Marey motor. The 'light' reactions were taken in a room of good south morning exposure, and those in the dark, in a dark closet of the same room. The stimulus was in all cases an auditory one -- a sharp metallic click -- and the reacting movement was a pressure downward of the right forefinger (in the case of the D'Arsonval instrument, a pinch of that finger and the thumb). The reagents were, besides the writers (B. and S.), Mr. Faircloth (F.), a student who had had only the experience gained from the practical work in this subject of the course in Experimental Psychology. His reactions were ready and unconfused, and from all appearances he was a normal and more than usually suitable man for such work. The fourth, Mr. Crawford (C.), is an honor student in this subject in Princeton. His reactions were taken in the course of another investigation, and being so few in number, they are included only because they give a certain case of a capable reagent whose sensory is shorter than his motor reaction. We hope to test him further. All the results secured by each instrument are corrected, by the constant error of that instrument, before being used either for comparison among themselves or for compounding with the results of the other instrument, in the tables which follow. The smaller variable error of the Hipp chronoscope makes the results of that instrument much more reliable in the matter of absolute time-measurement. But in the conclusions drawn below, only those results are used in which the quanity[sic] sought is a relative one, and in which the two clocks confirmed each other in giving ratios of difference of the two quantities compared, both of which are in the same sense, and each of which is larger than the largest possible ratio of difference arising from the variable error of the clock to which it belongs. The mean variations are not given in the tables which follow, because they are too complex to be of any value. These variations were different for the two clocks, as we would expect from the variable errors of the instruments themselves; they also varied with the disposition of the subject in the various groups of results which are treated together. The different mean variations for the different lots of experiments varied from 10s to 20s. For this reason no deductions are attempted except those evident on the surface of the results themselves. It follows from Table II. : (1) that the current distinction between sensory and motor reactions does not hold in the sense that the motor reaction is always shorter than the sensory, for in the case of F. the motor reaction is 40s longer, i.e., 1/3 of this subject's average sensory reaction time. (2) As between B. and S., in the case of each of whom the motor-time is shorter, there is a great difference in the relative length of the sensory to the motor. In B. the sensory time is only 18s, or about 1/9 longer than the motor, while in the case of S. the sensory is 48s longer, or about 1/4; and this despite the close agreement of the two subjects in their absolute motor-time. We would seem to have, therefore, in these three observers three cases shown, two giving very pronounced results; one a longer motor time by 1/3, and the other a longer sensor by 1/3. The third subject, B., seems to fail between these extremes, giving a difference in favor of the motor reaction, it is true, but a much smaller difference. 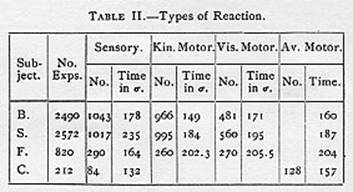 The tables also give us reason for accepting the truth of the distinction between two kinds of motor reaction. In both B. and S., whose motor reactions are shorter than the sensory, we find a difference in the length of the motor reaction according as the attention is given to the movement by thought of the hand, the eyes being blindfolded; or as the attention is fixed upon the hand, which is seen. The former I have called the kinæsthetic motor reaction, the latter [p. 263] the visual motor. In B. the visual motor is 22s, or about 1/7 longer than the 'kinæsthetic' -- that is, it is practically equal to this subject's sensory time; while in S. the kinæsthetic motor is 11s shorter than the 'visual.' With F., on the contrary, there is no distinction between the two kinds, any possible trace of it seeming to be lost in the excessive preponderance, in facility, of the sensory kind of reaction. The table as a whole, then, supports the views: (1) when the motor reaction is short in relation to the sensory (case of S.), then this motor reaction is purest, freest from sensory influences, such as sight, etc. ; (2) when the motor reaction is not pure, then it is retarded by such influences as sight (case of B. ); (3) where the motor reaction is relatively difficult and delayed, as compared with the sensory (case of F.), there this prime difference renders all kinds of motor reactions equally lengthy and hesitating. B. seems to stand midway between the two others in this respect. As I said some time ago, in making a first report upon the outcome of some of these experiments: "In subjects of the motor type the kinæsthetic motor' is shorter, the 'visual motor' time approximating the sensory reaction time." 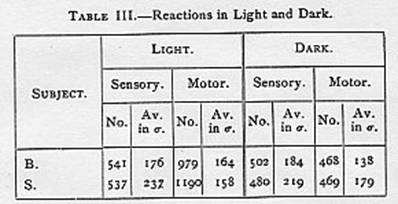 On examination the data of this table, compared with those of the preceding table, may be stated as follows: We find for B. that the sensory reaction is practically the same, whether he react in the dark or in the light (the latter is less by 8s, which is insignificant in view of the variable error). This shows this subject's independence of vision in the sensory reaction to auditory stimulations, and is in agreement with the results of Table II. (in which there is a similar difference between the sensory and visual motor, the former being longer by 7s). S., on the other hand, shows a shortening of the sensory reaction when in the dark by 18s, but a lengthening of the motor reaction when in the dark by 21s, or about 1/7. The latter result shows this subject's dependence upon vision only in the motor kind of reaction. IV. Interpretation.-- Admitting that these results indicate clearly the existence of persons whose sensory reactions to sound are shorter than their motor reactions, and that there is in some individuals a difference between the length of the motor reaction, according as it is made in the light or in the dark, we may make some general remarks on the theory of these differences. These results should be compared with earlier ones, a matter which is made easier by reference to the concise summing up of the literature of the subject by [p. 265] Titchener in Mind. We find cases of relatively shorter sensory times similar to mine reported (for electrical stimulus) by Cattell, and (for sound stimulus) by Flournoy. We may accordingly say that such individual differences are clearly established, and must hereafter be acknowledged and accounted for in any adequate theory of reaction. The attempt of Wundt, Külpe and others to rule these results out, on the ground of incompetency in the reagents, is in my opinion a flagrant argumentum in circulo. Their contention is that a certain mental Anlage or aptitude is necessary in order to experimentation on reaction-times. And when we ask what the Anlage is, we are told that the only indication of it is the ability of the reagent to turn out reactions which give the distinction between motor and sensory time, which Wundt and his followers consider the proper one. In other words, only certain cases prove their result, and these cases are selected because they prove that result. It is easy to see that this manner of procedure is subversive both of scientific method and of safely-acquired results in individual psychology. For the question comes: what of these very differences of individual Anlage? How did they arise; what do they mean; why do they give different reaction-time results? To neglect these questions, and rule out all Anlagen but one, is to get the psychology of some individuals and force it upon others, and thus to make the reaction-method of investigation simply the handmaid to dogma. The attempts to explain the relative shortness of the 'muscular' reaction, also, by those who hold its shortness to be a universal fact, have been unfortunate. It has been [p. 266] held that the muscular reaction is shorter because it is semi-automatic; the thought of a movement, i.e., attention to it, being already the beginning of the innervations necessary to its production. This is very true as a principle, I think; but it is just the application of this principle which makes it necessary on the part of some to restrict reaction work to people of a special aptitude. For in all those cases, either of particular reactions in one individual or of all reactions in other individuals, in which the movement is not so clearly picturable as to be firmly and steadily held in the attention, to these cases the principle does not apply. On the contrary, to all cases where it is difficult to get the attention fixed upon a motor representative of the movement, a very different principle applies, as Prof. Cattell has said. The very attempt to picture a movement as a movement -- by putting the attention on its motor aspect in consciousness -- embarrasses, confuses and delays the execution of that movement in these cases. If a marksman attend to his finger on the trigger he misses the target; if a ball-player attend to his hands he 'muffs' the ball; if a musician think of each finger-movement he breaks down. The musician in the laboratory is usually, indeed, a glaring instance of unsuitable Anlage! So it is evident that these two principles need reconciling in their application to reaction-times, the principles, i.e., (1), that the thought of a movement already begins it, facilitates it, quickens it; and (2) that attention to a practised movement, in· many instances, embarrasses it, hinders it, lengthens it. "I have endeavored incidentally, in an article now in print for the July issue of the Philosophical Review to account for the conflicting results of experiment in this field, by borrowing from the medical psychologists the results of their brilliant analysis of the speech function, on the basis of its pathology. The recognition of the great forms of aphasia -- i.e., sensory and motor -- and the corresponding recognition of the existence of visual, auditory, and motor speech types, gives a strong presumption that the distinction between sensory and motor in the voluntary movements of speech and writing applies as well to voluntary movements of all kinds; that is, to all movements which have been learned by attention and effort. This means that a man is an 'auditive,' or a 'visual,' or a 'motor' In his voluntary movements generally. His attention is trained by habit, education, etc., more upon one class of images than upon others, his mind fills up more easily with images of this class, and his mental processes and voluntary reactions proceed by preference along these channels of easiest function. "If this be true, it is evident that a man's reaction-time will show the influence of his memory type. The motor-reaction we should expect to be most abbreviated in the man of the motor type; and less abbreviated, or not so at all, in the 'visual' or 'auditory' man. And experimental results must perforce show extraordinary variations as long as these typical varieties are not taken account of. We are accordingly, I think, a long way off from any such exact statement of absolute difference between sensory and motor reaction-time as Wundt makes in his last edition." It was a sense of the great naturalness and probability of this hypothesis that led me early in the fall of 1892 to institute the experiments on 'visual' and 'kinæsthetic' motor reactions whose results are given above in this paper. The secure establishing of cases which show sensory reactions shorter than motor (i.e., the cases now reported by Cattell, Flournoy and myself), together with the probable [p. 268] distinction between the 'visual' and 'kinaesthetic' forms of motor time, make it advisable that this hypothesis should be put in clearer evidence. I shall therefore proceed to State the case for it briefly on the basis of the facts as they are now known. The doctrine of 'types' rests upon certain facts which may be briefly summed up. A voluntary motor performance -- say speech -- depends in each particular exercise of it, upon the possibility of getting clearly in mind (intérieur, innerlich) some mental picture, image, presentation, which has come to stand for or represent the particular movements involved. This mental 'cue' or representative may belong to either of two great classes: it may be a 'sensory' cue or a ' motor' cue. People are of the sensory type or of the motor type for speech according as their cue in speech is sensory or motor; that is, according as in speaking they think of the sounds of the words as heard, the look of the words as written, etc. -- the cues furnished by the special senses associated habitually with speech -- this on the one hand; or according as, on the other hand, they think of or have in mind the movements of the vocal organs, lips, tongue, etc., involved in speech. In the 'motor' people there are incipient movements in mind; in the 'sensory' people there are special sense images in mind. All this is now so clear from the pathological cases examined that the theory of localization of brain areas and their connections is applied to the successful exploration of damages of the brain when aphasic symptoms furnish the main diagnostic resource. Now, let us see how in these cases of aphasia the two principles spoken of are applied. Suppose we agree with the neurologists in saying that the function of the 'cue' -- the mental image, be it either motor or sensory, which when thought of enables a man to speak -- is to release energy from its own brain-seat, along association fibres or pathways, to the motor-seat which sends its discharges out to bring about the movement. Then the difference between sensory and motor people is simply that different centres -- different 'cue'-seats -- have these connections with the motor speech centres best or better developed. A man who speaks best [p. 269] when he thinks of the sounds of the words has his best 'cue'-seat in the auditory centre; and his best pathway to the speech motor-centre goes out from this 'cue'-seat. For the man who speaks best when he thinks of the utterance of words, the same may be said of the muscle-sense seat. So it is evident -- apart quite from the question as to how one or other state of things comes to be as it is in any one case -- that with one man attention is directed to the movement for the best results, with another to the sensation or special memory image in best association with the movement. With the former the thought of the movement begins the movement. But with the other, if the best doing of the movement comes from thinking of a sensation or special image, then the movement will be relatively deranged, embarrassed, when the attention is drawn from this sensation and forced to fix itself upon the movement itself. These, then, are the two principles we desiderate, and they are both natural parts of the 'type' theory. So why not generalize this? Speech cannot be considered an exceptional function in its rise and mechanism. Other complex motor functions show the same kinds or types of execution: handwriting, music performing, etc. The hand has, next to the tongue possibly, the most delicate, varied and differentiated functions to perform; and the laws of association by which sensory cues, checks, controls, are affixed to hand actions and combinations, must be the same as those involved in speech. So in simple hand movements people must show the sensory and motor types. This is my hypothesis. "We have in this fact of types the explanation of the contradictory results reached by different investigators in the matter of motor reactions. Some find motor reactions shorter, as I have said above; others do not. The reason is, probably, that in some subjects the 'sensory' type is so pronounced that the attention cannot be held on the muscular reaction without giving confusion and an abortive result. On the other hand, some persons are so clearly 'motor' in ordinary life, that sensory reaction is in like manner artificial, and its time correspondingly long. And yet again others may be neutral as regards sensor or motor preferences. If this be true, another element of 'abounding uncertainty' is introduced into all the results of experiments so far performed in this field, as reflection on the matter will show." One or two further points, however, may be made which give the correct interpretation more importance than the simple facts in themselves really have.. In the first place, an additional tendency seems to show itself when movements become very habitual -- a tendency recognized in all discussions of the principle of habit. Habitual performances tend to become independent of consciousness, attention, thought, altogether. This tendency should make itself evident in reaction-time work, and reagents of great practise should show, (1) diminishing time in all reactions, and (2) diminishing difference between the two kinds of times, sensory and muscular. Further, the same tendency should show itself in a diminishing difference between individuals [p. 271] of different types as they both get more practise. All these results are, I think, clearly shown in those of the earlier researches in which the amount of practise is reported. And, again, finer distinctions of type follow from the general theory: such distinctions as those clearly established for speech. The 'visual,' 'auditory,' and possibly (as in the blind) 'touch' types of speech are all included under the head of sensory. As I have said, the speech case is a case of finer reaction-time distinctions. And the hand, as used in most reaction experiments, ought to show to a greater or less degree similar distinctions. The cases so far discovered of relatively shorter sensory reactions seem to be, as far as reported, auditory (musicians) and visual (Flournoy's). To determine between 'visual' and 'auditory' times for any individual, of course the same set of reaction experiments should be made with the two classes of stimulations, each being compared with the muscular reactions to the same stimulus respectively. The general result follows (if this hypothesis get acceptance) that the reaction-time experiment becomes of use mainly as a method. Distinctions supposed to be established once for all by various researches must be considered as largely individual results, inasmuch as the authors have not reported on the type of the reagent. But for that very reason these results may have great value, as themselves indicating in each case this very thing, the type of one single reagent, and in so far some of the general characteristics of that type. What we now desiderate in a great many departments, as, for example, in the treatment of school children, and in the diagnosis of complex mental troubles, is just some method of discovering the type of the individual [p. 272] in hand. If reactions vary in certain great ways, according to the types which they illustrate, then in reaction experimentation we have a great objective method of study. But before the method can be called in any way complete, there should be a detailed re-investigation of the whole question, with a view to the great distinctions of mental type already made out by the pathologists. A word should be added concerning the position of Professor Flournoy. The hypothesis which I have advanced has been attributed also to Flournoy, his name being connected with mine as independent advocates of it (by Cattell, Titchener, etc.). I think this is a mistake, at least so far as the publications of Professor Flournoy are taken as evidence. His case, cited as of the 'type visuel,' seems to imply the existence of other types it is true; and at the close of his second article he raises the question, "si la façon de reagir observée chez M. Y., n'est qu'une singularité individuelle, ou si elle est un fait générale et constant dans le type visuel d'imagination." But what he means in the context by 'type visuel' is not what is meant by that phrase in the generalized usage of the pathologists. His case is 'visual' in the sense that the man thinks of movements by a visual picture of his arm, rather than by muscle-sense images (just what I have distinguished above as 'visual motor' in distinction from 'kinæsthetic motor;' and the case is a fine confirmation of the conclusions given above under that head). But it does not follow that the man is a 'visual' in the broader sense. He might just as likely be an 'auditive.' The most that can be said of Flournoy's case, on the general doctrine of types -- other evidence aside -- is that he is 'sensory,' and on my theory his shorter sensory reaction-time proves it. But Flournoy makes no such general application of the theory of types. Indeed, in asking the question which I have quoted from him (i. e., whether all visuals would react as this man did), he shows that he does not mean [p. 273] to bring reactions generally under the type theory. For the real 'visual' might give a shorter 'visual motor' than sensory' time -- i.e., when the stimulus reacted to is other than visual (say auditory); since then the visualizing habit would throw its influence on the side of the motor reaction. In the matter of the distinction between 'visual motor' and kinæsthetic motor' reactions, however, Flournoy's case clearly anticipated mine in print. Finer distinctions were aimed at in some of the series, such as placing the sound stimulus on one side only, or in the median plane below the head, etc., as well as arranging for the difference between light and dark environment. The 'dark-reaction' was not secured from F., the 'sensory' subject; but we hope to report further results obtained from C., the similar case now found in Princeton. Arch. des Sci. Phy. et Nat., XXVII., p. 575, and XXVIII., p. 319 Titchener, in his summing up, does not cite the cases of Flournoy nor the earlier report of one of my present cases (F.) in the Medical Record, Apl. 15, 1893, although they tell directly against his own views. My earliest case was noted by me in the autumn of 1892, and the note in the Medical Record was written in December, 1892, before I saw either Cattell's or Flournoy's articles. The sentences quoted from my Senses and Intellect by Titchener in Mind, loc. cit., were based upon my own reaction-times, taken earlier when I had no reason to doubt the universality of the experience, as claimed by Lange and Wundt. Titchener is accordingly wrong in citing me as favoring that position. See the Medical Record (N.Y.), loc. cit. Article entitled " Internal Speech and Song," Phil. Rev. July, 1893. Physiologische Psychologie, 3d ed., II., p. 261 ff. At the Philadelphia meeting of the American Psychological Association, on Dec. 28, 1892, I proposed the hypothesis informally to several American psychologists. Dr. Lightner Witmer will remember a conversation in which the point was remarked upon. I venture to make these personal explanations since a somewhat similar explanation of his cases was advanced by Prof. Flournoy, of Geneva, in the articles cited above. I was not acquainted with Prof. Flournoy's views until, a year later at the New York meeting of the Association, Prof. Cattell brought them to my attention, as given in abstracts in the Revue Phlosophique and the Zeit. für Psych. I return to Flournoy's position later on in this paper. See my Mental Development: Methods and Processes, pp. 91 ff., and 438 ff. In Chap. XIV. of that work, on 'The Mechanism of Revival,' I have endeavored to put in evidence the general principles which underlie the type theory. Consequently it does not do to say, with Wundt and Külpe, that the 'muscular' reaction is more automatic. Of course it is so in those who give a shorter motor reaction -- that is sufficient proof of it. But that the sensory time is shorter in others is sufficient proof, also, that in their case the sensory reaction is more automatic. Külpe's two-arm reaction experiment is subject to this criticism, among others (see Wundt, loc. cit., p. 325 ; Külpe's Grundriss, pp. 422 f.). A possible instance of such variation is seen in the ease of Donders, which Wundt has difficulty with (Phys. Psych., IIIe., II., p. 268). Say the reagent was 'visual' in his type, and we have reason for his shorter reaction to light than to sound, while he still falls under the sensory type in general. I have earlier indicated (Med. Record, loc. cit., and Philos. Rev., loc. cit. ), the possible use of this method by brain surgeons, an idea which Wallaschek comments on with approval. Certain general indications from reaction-times are already recognized by physicians, especially in investigating various anæsthesias. Since revising the proofs of this article I have received a not from M. Flournoy in which he says: "Je suis, d'une façon générale, d'accord avec vous sur l'influence du type d'imagination" (making reference to my article in the Medical Record).